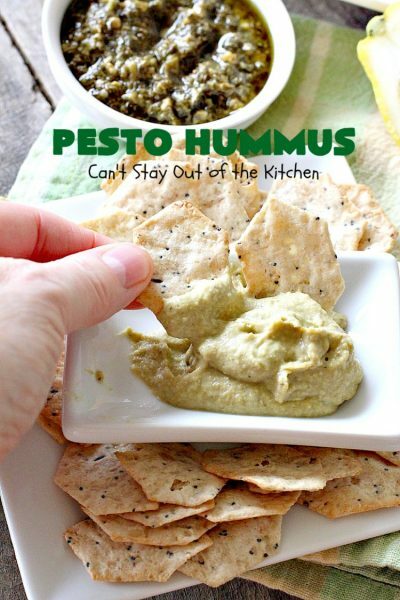 Pesto Hummus is to die for! 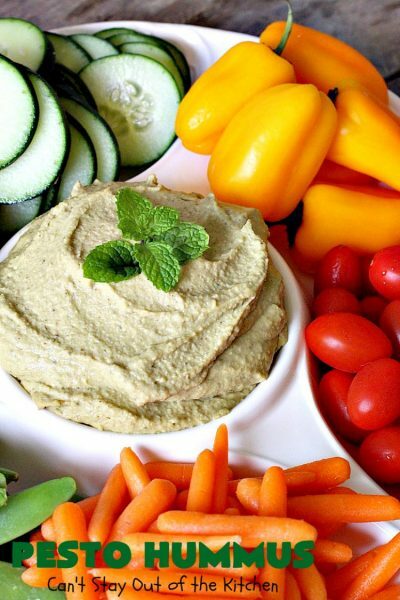 This scrumptious hummus recipe is one of the best I’ve ever made. The tastes were so amazing. 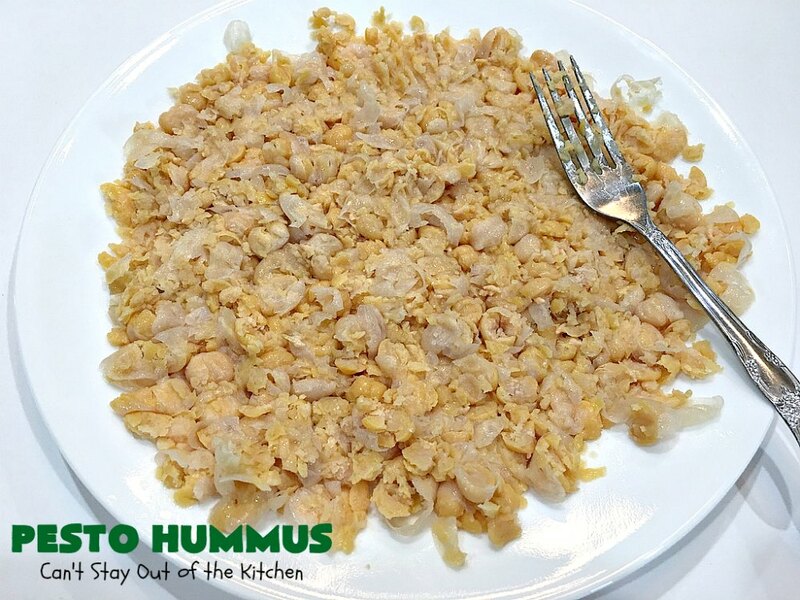 Hummus, with all the usual ingredients like tahini (sesame paste), tamari soy sauce, lemon juice and garlic. But then with a splash of extra flavor due to the cayenne pepper and pesto sauce added to the batch. Oh, my. 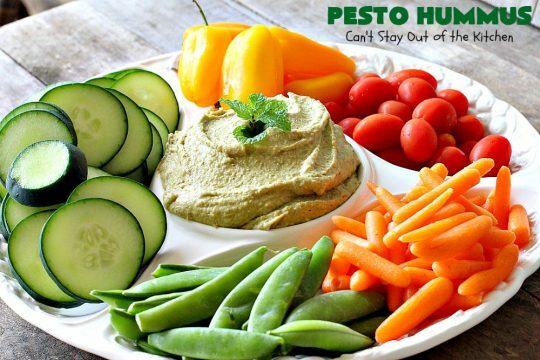 Pesto Hummus has everything you want in a hummus recipe: spectacular taste, great texture, low calories, and it’s also a great healthy option for eating your vegetables instead of always using Ranch dip! I was making a large brunch-type spread for our Vacation Bible School workers last week and wanted to come up with some fun ways to serve veggie trays. Making hummus with pesto sauce was a fantastic idea. All I can tell you is this hummus recipe had F-A-B-U-L-O-U-S taste. I loved it. Even all the kids who sampled it (and there were many) LOVED this recipe. In fact, many are waiting for me to post the recipe so they can make it themselves! I made lots of tasty treats for our VBS workers last week and this one was rated one of the best and got quite a few WOWS! Teenagers have notoriously picky palates, so when you’re teenagers taste this and love it and tell their friends, you know you have a winner! 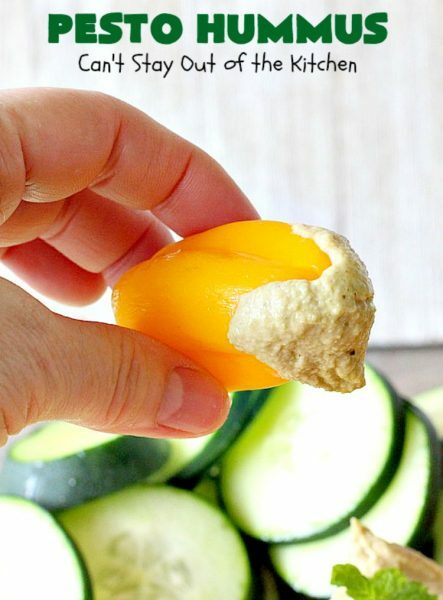 Another nice thing about making hummus that tastes as great as Pesto Hummus, is it’s a great way to get your kids to eat their veggies. Additionally, you can use up garden produce or an abundance of veggies from your Community Supported Agriculture group. 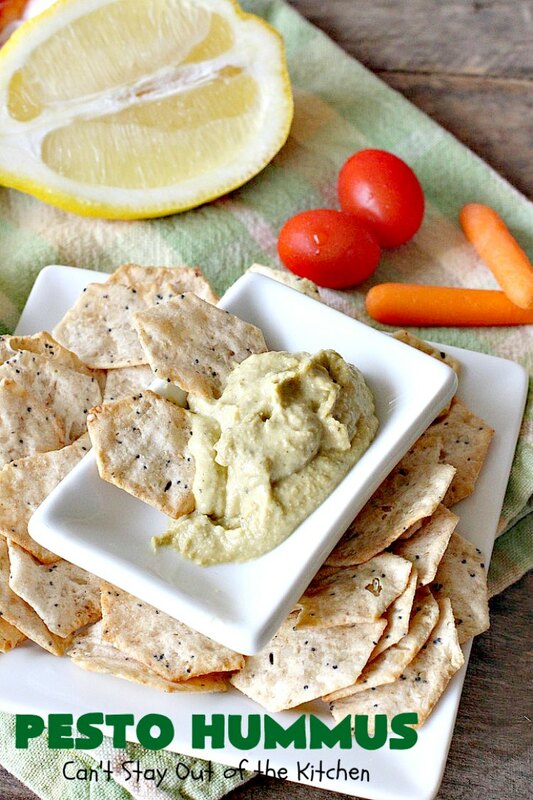 This appetizer is terrific with pita chips and crackers or chips as dippers. It’s also marvelous with veggies. 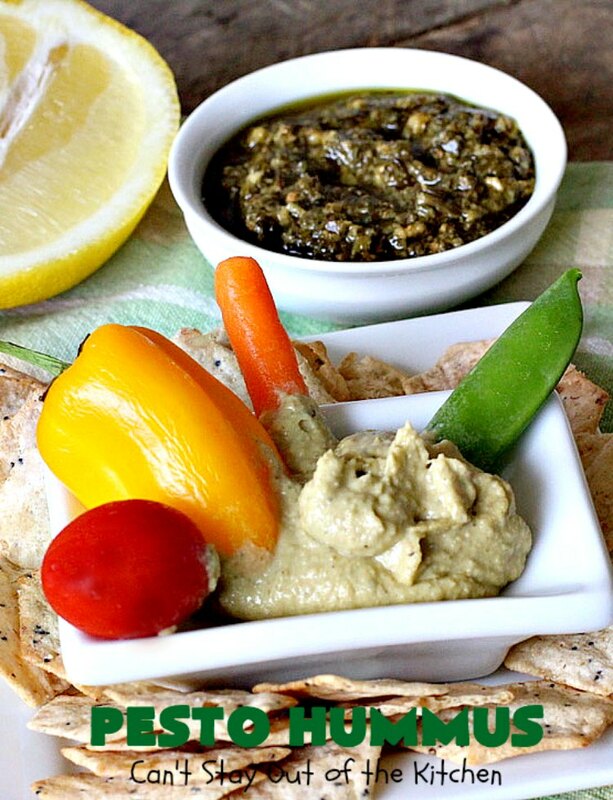 Pesto Hummus is gluten free and vegan. It’s a great weight reducer as it’s a lot lower in calories than a lot of snacks. It’s also very healthy. This great snack is perfect to provide for after school lunches. Take it along with you to your kids’ baseball or soccer practices and munch on while you’re waiting. 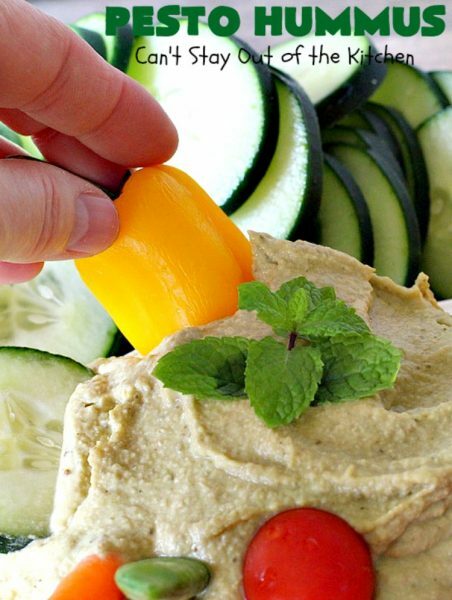 If you’re looking for a spectacular hummus recipe to wow your guests for the next time you serve snacks or appetizers, than look no farther than Pesto Hummus. 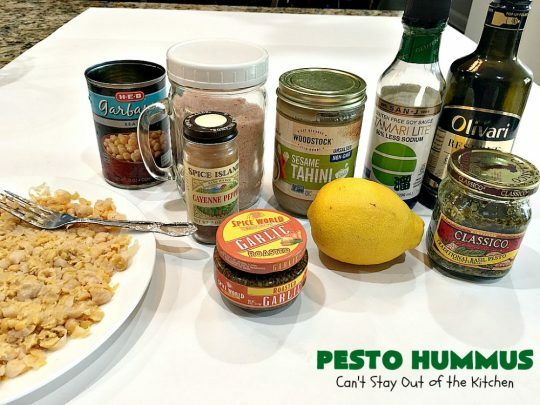 It is the BEST Pesto Hummus recipe you’ll ever try! I originally in July 2013, shortly after I began using my new Canon camera. The pictures were okay but I wanted to make the recipe creamier this time. Back in 2013 I didn’t have a Vitamix blender. When I recently remade this recipe (September 2018), I wanted to use the Vitamix. I blended the ingredients about a minute and the results were so much creamier than the old blender I had in 2013. I sent a tray of this hummus along with veggie dippers to some friends of ours who had someone convalescing in their home. I also included a Rustic Peach Galette. 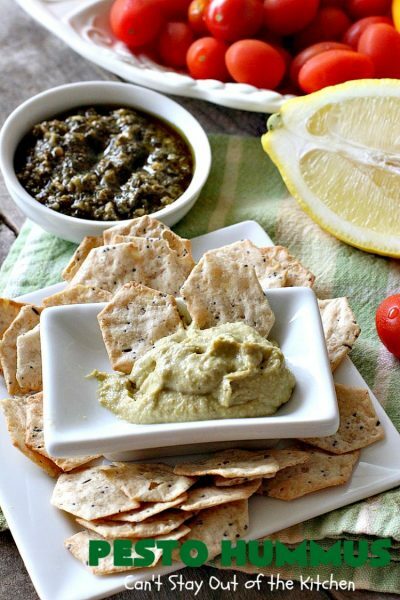 Even their adult children and grandchildren really enjoyed this delicious Pesto Hummus recipe. 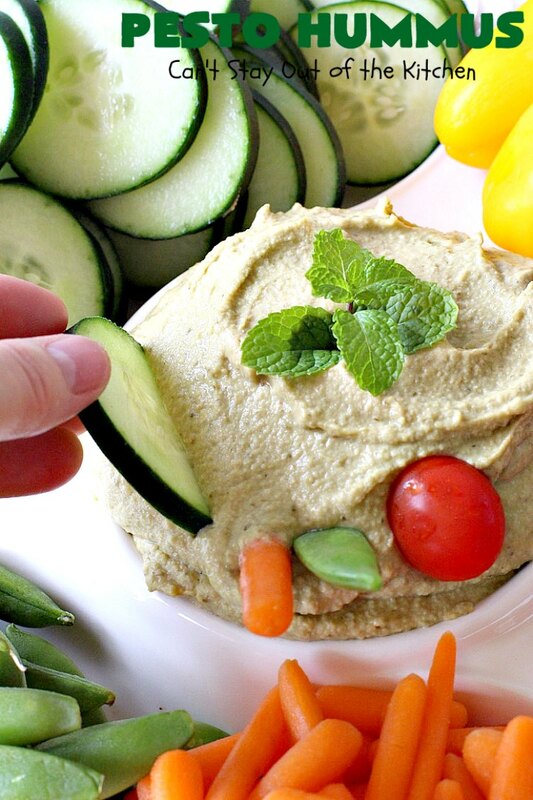 Pesto Hummus is some of the best hummus you will ever eat! This is a great recipe for afternoon snacks. Pesto Hummus is a great accompaniment to veggie dippers and a great way to get your kids to eat their veggies! The combined tastes of pesto and hummus are simply A-M-A-Z-I-N-G!!!! Drain garbanzo beans. Mash beans on a plate. 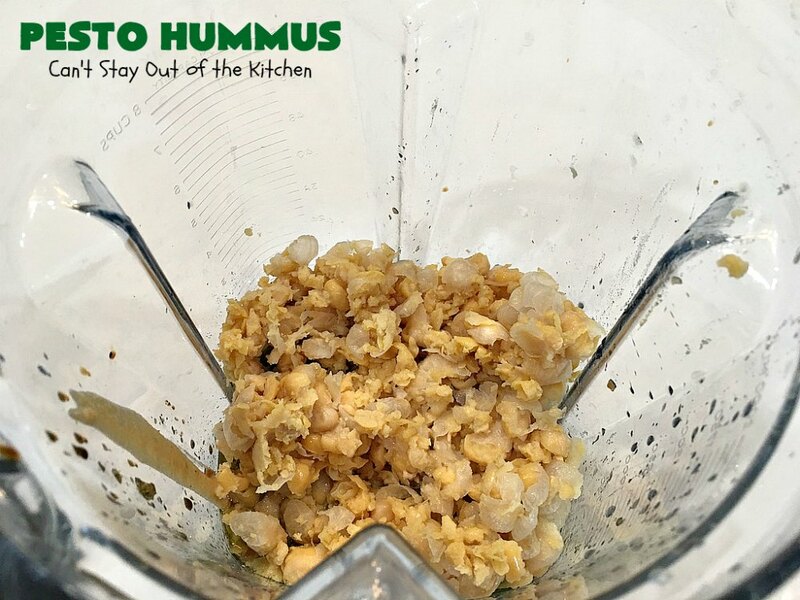 Place mashed garbanzo beans in a Vitamix or electric blender. 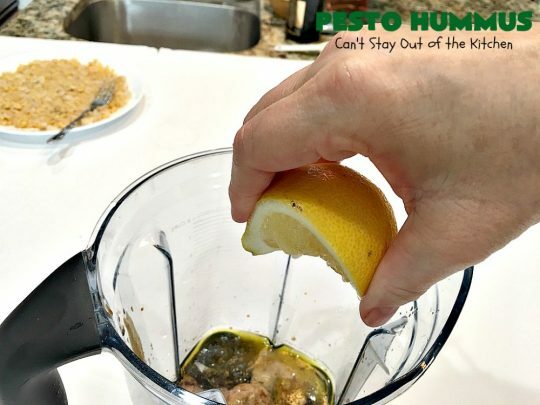 Add roasted minced garlic, sesame tahini (ground sesame seeds), Tamari soy sauce (gluten free, low sodium), fresh lemon juice, olive oil, salt and cayenne pepper and pesto sauce. Blend or process until smooth. I processed about one minute – 30 seconds at a lower speed and 30 seconds at a higher speed. I wanted the hummus to be really smooth and creamy. Spoon hummus into an appetizer platter. Add fresh veggies to serve as dippers. Pesto Hummus is some of the best tasting hummus I’ve ever eaten. It has simply marvelous flavor. It can be served with anything, though it tasted great on crackers! 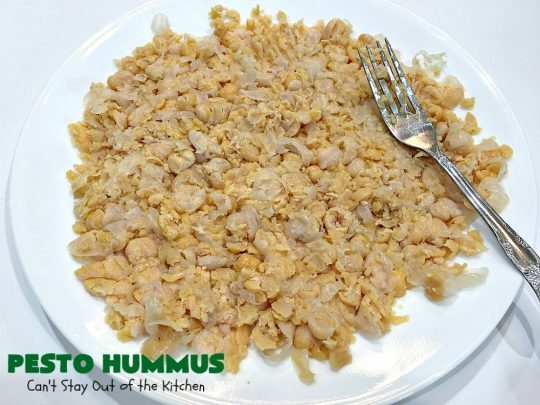 I had a guy who grew up eating middle eastern food sample this hummus and he thought it was excellent. This is a great recipe to make up for low calorie snacks or afternoon snacks — especially if you serve it with raw vegetable dippers instead of chips or pita bread. 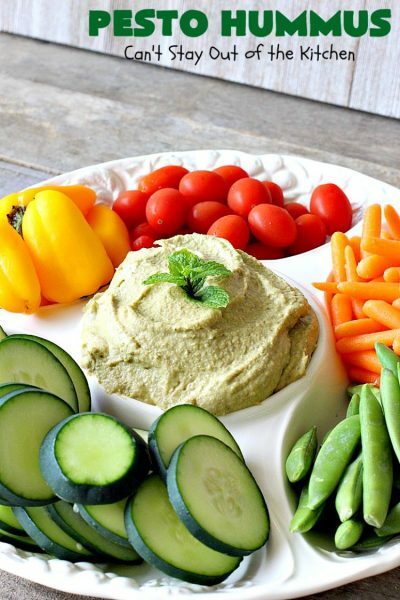 Pesto Hummus is an absolutely mouthwatering hummus recipe that's filled with basil pesto, roasted garlic and garbanzo beans. 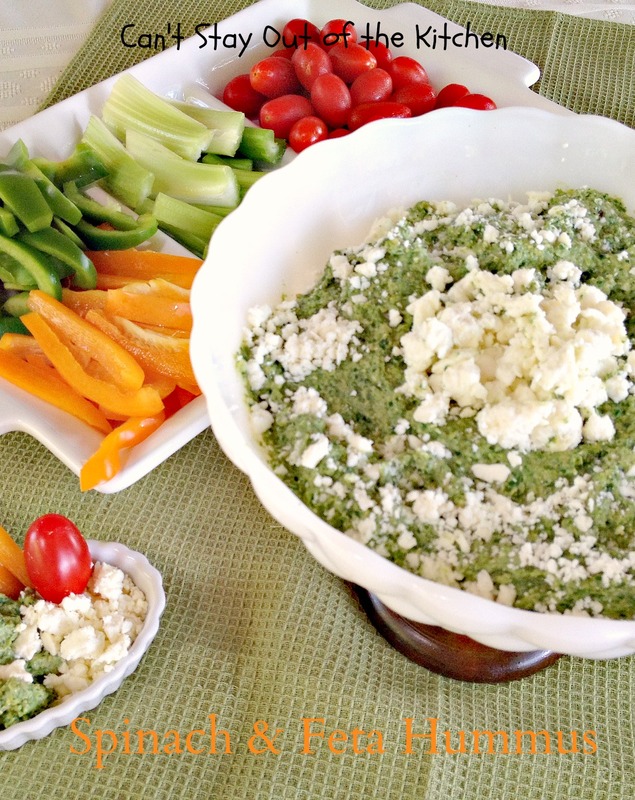 It's a terrific appetizer that's great for tailgating parties, potlucks or backyard barbecues. 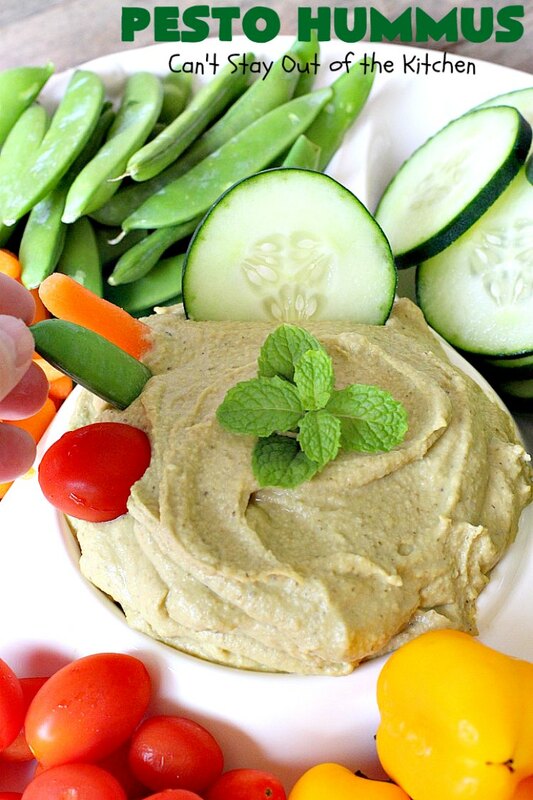 This quick & easy hummus is low calorie, healthy, clean eating, gluten free and vegan. Put garlic, tahini, water, lemon juice, tamari, olive, salt and pesto in blender or food processor. Pulse or process until thoroughly mixed. Makes about 2 cups hummus. NOTE: This recipe turns out smoother if you mash the garbanzo beans before adding them to your food processor or blender. NOTE: Stir pesto sauce before using. NOTE: I ran the Vitamix at low speed for about 30 seconds. Then I increased power to a medium to high speed for an additional 30-40 seconds or so, until the hummus was smooth and creamy. Absolutely mouthwatering hummus recipe that’s quick and easy. This recipe turns out smoother if you mash the garbanzo beans before adding them to your food processor or blender. Pesto Hummus is a great way to use up garden produce and extra vegetables you need to clear out of your refrigerator. This is a great appetizer to serve guests before a meal, too. 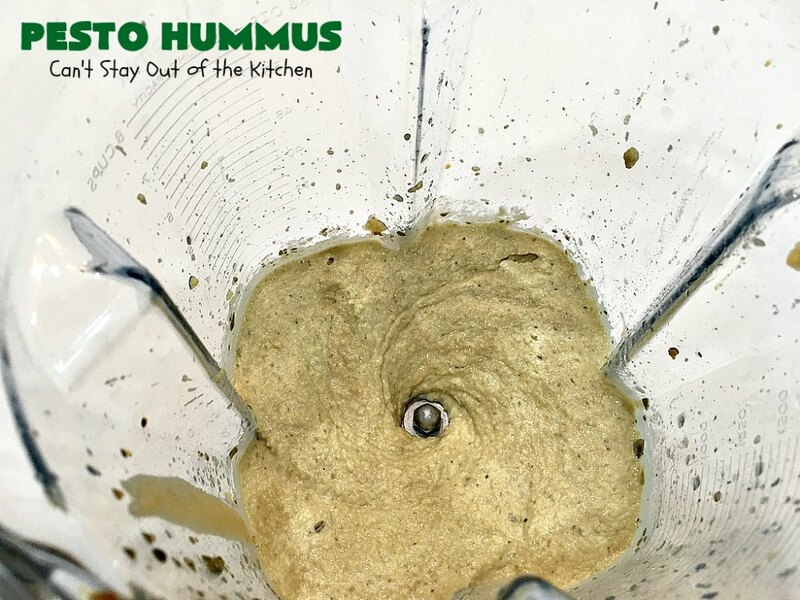 Bring some Pesto Hummus to your next office party or meeting and everyone will rave over the delicious taste of this recipe. 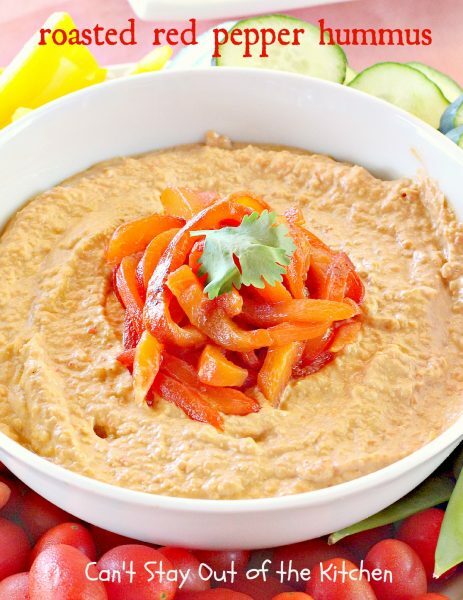 Even people who don’t normally eat hummus will LOVE this recipe.